Originally sold in kit form, this used a single AA battery to supply the required 1.5V, but I have made this a little more user friendly by using a voltage divider to get it down to 1.5V for the circuit and so allowing the use of a standard daisy chained 9V supply. If you'd prefer to just use an AA battery then you can omit the 10K and 2K resistors on the right hand side and take the supply directly to the top row. The 100u filter capacitor at the bottom right will also need moving to go between the top and bottom rows. Some people have noted that the circuit can lack volume, so consider putting your favourite booster in the same box if you find the same thing. The "Mod" Sound For Any Guitar Amplifier. 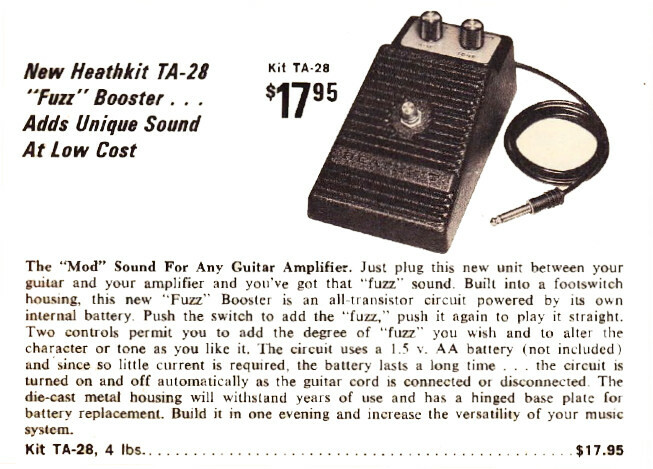 Just plug this new unit between your guitar and your amplifier and you've got that "fuzz" sound. Built into a footswitch housing, this new "Fuzz" Booster is an all-transistor circuit powered by its own internal battery. Push the switch to add the "fuzz", push it again to play it straight. Two controls permit you to add the degree of "fuzz" you wish and to alter the character of the tone as you like it. The circuit uses a 1.5V AA battery (not included) and since so little current is required, the battery lasts a long time ... the circuit is turned on and off automatically as the guitar cord is connected or disconnected. The die-cast metal housing will withstand years of use and has a hinged base plate for battery replacement. Build it in one evening and increase the versatility of your music system. Modded version with volume trimmer (top) and supply trimmer (bottom) to fine tune the 1.5V supply. Swapping that 2K7 for a 5K pot would probably make a useful fuzz control. Jimiphoton's video on DIY forum is pretty great, so I might have to try this one day. Soooo... No diodes involved at all dropping the voltage from 9v to 1.5 volts? Just checking--I remember that SmallBear build for the Maestro with a trio of 1N4001s. No. It's voltage divider, that drops it from 9V to 1,5V. Don't know what it does to the current consumption though. Cool, and thanks for the link... Learning all the time! glad to see this circuit going around. 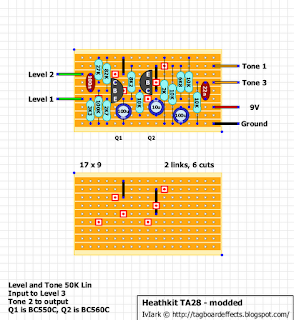 to fix it... make the 1k's in the tone stack 10k...i put a thread on diystompboxes. to drop the voltage, yes, 3 1n4001's and a 10k resistor if memory serves...you get 1.5 v for the pedal, and 9v to run your led etc. but you can build that or adapt the layout to include it pretty easily. Awesome! I plan on using your layouts to make these. I wanted to ask you about the schottky diode in the power supply, since there is no specifications for it. Is there a specific type i should choose for the job? oh yah...duh... pull out the 10k resistor before the tone stack, and slap a 5-10k trimmer in there as a variable resistor, then you can dial it in for unity gain...that resistor really makes a difference. Dude. There's an error. Hint: Check the 8K2 and the link involved with it. you can go with a trimmer, or use about a 5k pot. 10 k, tho on the original circuit, is just a little too big. on mine, i settled on about 3.9k. the circuit sounds better slightly "hot", too...shoot for about 1.6-1.7 volts for the sweetest distortion. Stupid links! Gonna have to rejig it now to get the link in the right place. There's always a chance with voltage dividers that the output may be slightly different because it's totally dependant on the ratio of the measured values of the two resistors. If one is slightly high and the other is slightly low then you could be off by a couple of 10ths of a volt. Better to test them first I suppose with a 9V battery and measure the output before installing. I just resoldered the 8K2 standing up and it works, but it is nowhere near unity. I'll play around with the 1Ks at the tone to ground. That seems to be the place where the signal gets dumped. Jimi suggested making the 1K's in the tone stack 10K. Don't know if that was the problem though. Thinking about the divider it'd probably be better to do it with a single trimmer instead of two resistors then you can fine tune it exactly. making the two 1k's 10k was lucifer's trip on diy's suggestion, brought the thing to life. 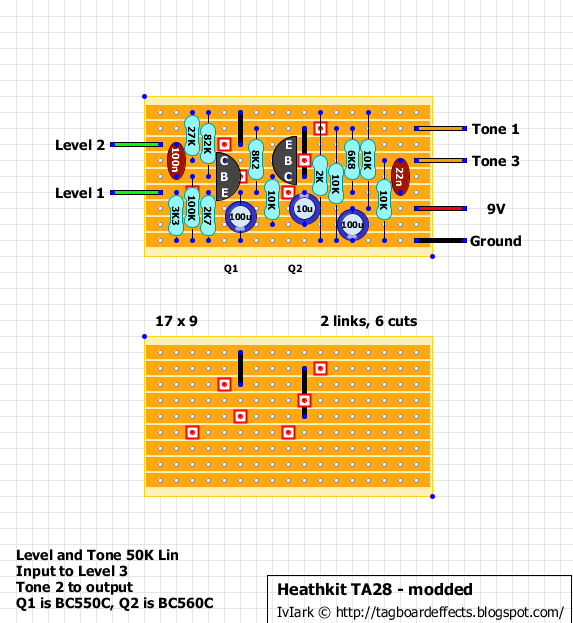 replacing the 10k going into the tone circuit with a 5-10k pot (or trimmer) will give you a very useable volume control...in the interest of not adding another knob, i went with a resistor, tried 10k, 4.7k, 3.9k, 3.3k ,2.7 and 2.2 k... seemed best, again about 3.9 to me....so a 5k pot should work well. 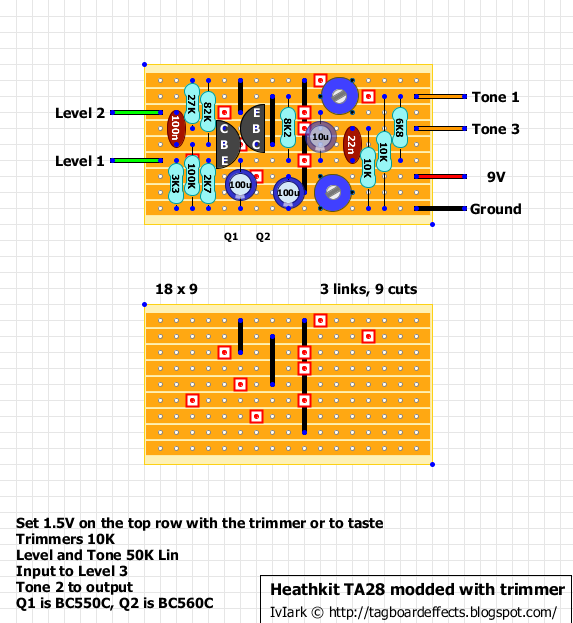 I have 12Ks in place of 1Ks at the tone, and it's around unity - with trimmer (the one that replaces the 10K at Q2 collector) set at about 0. I've tried a few different sets of transistors, 2N2222/2N2907, BC550/BC558, 2N5088/2N5087 and finally, MPSA13/MPSA63. With 1,5 voltage (i have 1,7 with 3K9 resistor), there seems to be virtually no difference between the sets. I left the 2N5088/87 in, but it's still just an ok vintage fuzz. Nice, not shocking, but nice. One could try to up those two resistors between tone and ground until it overdrives - otherwise the level control is quite unavailing..
hmmmm, i've got way more than unity gain on mine, the fuzz control starts at unity and goes up from there. you realize (i didn't notice if it's marked) q2 has gotta be pnp, right? if ya put an npn in, it will probably still pass signal, but won't be even close to as loud. i used a mpsa18 for q1, and a 3906 i think for q2... you should be able to get a good 4-6 db boost when the fuzz is cranked up, easy. i'd reccomend check your wiring if replacing q2 doesn't help..sorry, not familiar with the trannys you used, so no diss intended at all. mine is fairly screaming...and the 10k resistor before the tone stack being shorted (ie: having the volume trimmer/pot all the way up) should be wayyyyyyyyyy louder...makes me suspect something's amiss here. thanks, glad you enjoyed the "stupid pedal trick"
i recently gave the one i built to my bro mike, he lost his original in a barn fire almost 30 years ago. as soon as he plugged it in, he started to smile..
i asked if it sounded like he remembered, he said yes. So, lower 10k trimmer is for voltage tweak and upper 10k is for tweaking the master volume output? If this is the fuzz that was mounted on the Hofner Ambassador guitar than you can hear it on the riffs played all over the first 3 albums by Grand Funk Railroad. Killer Fuzz. I guess a 1N5817 will do.. right Mark? Miro? 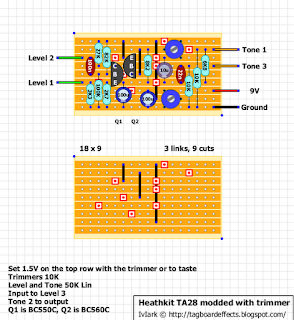 I'm planning on building a TA 28 with the circuit above, but as far as i can tell the type of schottkey diode in the schematic is not specified. Wanted to check this with you guys first. I guess Dorons reply was a suggestion for a suitable diode. That's what I meant, in deed. Mark's confirmation would set this issue straight. lvlark: What type - more specifically - would you recommend for D4? I'd use the 1N5817's as Doron mentioned.